Asan Egiz, Qurultay of the Crimean Tatar People delegate, detained in Crimea on May 23 was beaten and left on a highway, as Refat Chubarov, the Chairman of Mejlis of the Crimean Tatar People, wrote on Facebook. “Asan is badly beaten. Later, we expect an explanation on what happened from Aider Azamatov, the lawyer,” Chubarov wrote. He added that according to Abdurman Egiz, Asan’s brother, people wearing police uniform stopped the car of Qurultay of the Crimean Tatar People delegate. “Then, he (Asan Egiz) was forced to get into the car and taken away. They put a sack on his head, tied his hands, threw on the car’s floor. He was stopped on Simferopol-Bakhchysarai highway. From the mentioned place Asan came back to Simferopol,” the brother of the detainee noted. 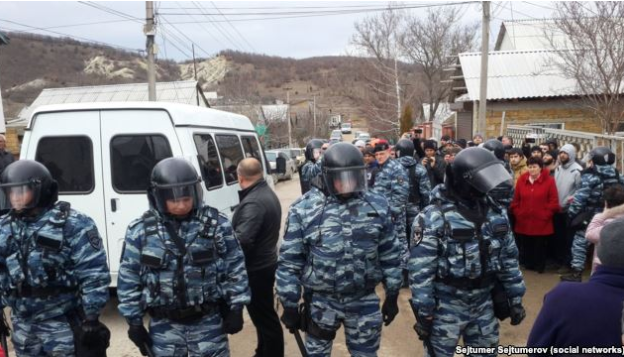 As we reported earlier, Russian security forces detained Asan Egiz, Qurultay of the Crimean Tatar People delegate, in annexed Crimea. Near Pionerskoye village Russian punishers on Volkswagen car equipped with flashing lights and sound units forced his car to pull over. Later, the perpetrators took Egiz in an unknown direction. Earlier, Russia annexed Crimea in March, 2014. Crimea was declared a temporarily occupied territory, The Verkhovna Rada of Ukraine has officially declared February 20, 2017 the beginning of Russia’s occupation of Crimea and Sevastopol. Petro Poroshenko, Ukraine’s President, signed a relevant law on October 7, 2015. The international organizations acknowledged the occupation of Crimea and condemned Russia’s actions. Western states imposed a series of economic sanctions. Russia denies the occupation of the peninsula and calls it a “restoration of historical fairness”. After Russia annexed Crimea, the population of the peninsula is being regularly searched and questioned. The human rights defenders describe it as “a struggle against dissidence”.